On Sunday 29th September, Bellinis Newry were the hosts for the 6th Annual Darts Tournament in Honour of Christopher Sexton. A very enjoyable day was had by all and £385 was raised for PIPS Newry & Mourne in the process. Thanks was extended to Bellinis for hosting the event and all those who sold tickets and participated in any way to making this a very successful event. PIPS Newry & Mourne would like to thank Stephen and all those who participated in the tournament for their very kind donation to our organisation. 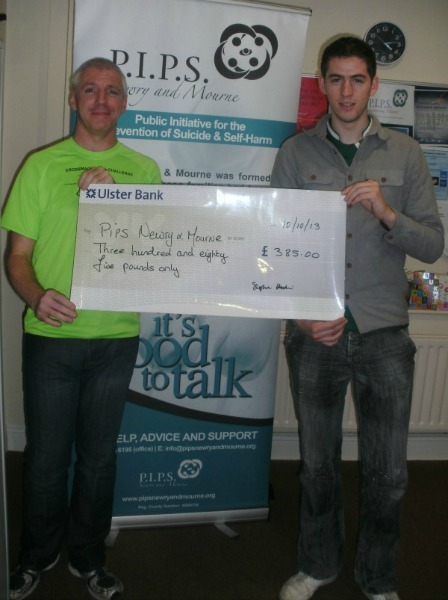 Pictured is Stephen Henkin presenting a cheque to Kevin Gallagher of PIPS Newry & Mourne.